We have been experiencing the most active weather season in U.S. history. Still, some scientists predict even more calamities are ahead. Call it global warming. Call it Mother Nature. Call it God. Whatever your perspective, recent weather events make a strong case for emergency preparedness. Of course, if we knew the time and place of the next disaster, we’d all be prepared. We’d have our survival supplies gathered and our families organized. But we don’t know. Therefore, common sense says we should err on the side of readiness. Tornadoes, floods, and earthquakes are traumatic events. This stress can get compounded by the lack of a family Emergency Plan. If cell phone service goes out, how do you locate your family? How will you know if your kids are safe? How will you know where to meet them? Natural disasters often strike quickly. They can displace you from your home or confine you to it. What would you do if your gas, water, and electric services were disrupted? Below are a few tips to help you create a basic Emergency Plan for your family. Have a family meeting and determine your needs. Create a list of food and supplies you’d need for your family to survive 3 days, independent of the grocery store or services such as water, gas, and electric. Emergency assistance may not be readily available. Agree on a central meeting spot after a calamity. Where would your family gather if cell and home phone communication is interrupted? Every family member should be aware of the spot. This puts your family on auto-pilot without need for phones. After gathering, decide the next move from there. Enough medications for 3 days, include extra prescription glasses. A hand-held radio, battery powered or crank powered. Matches in waterproof container, candles, and flashlights with extra batteries. A mid-sized First Aid Kit with manual, and a local map. Rudimentary tools, like pliers, to turn off utilities. Personal defense options; a fire extinguisher. Feminine products, wet wipes, and hygiene products. Non-scented chlorine bleach and medicine dropper. Add 1-part bleach to 9-parts water. Bleach water becomes a good disinfectant, or water disinfecting tablets. Choose an out-of-town contact to act as central command. Displaced family member can call them to check on the status of other family members. This contact can also coordinate a meeting. Make preparations for those with disabilities and pets. For a grab-n-go solution Quakehold! 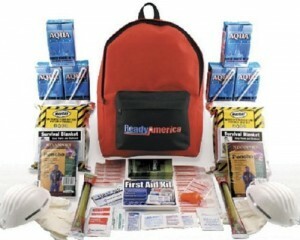 offers a $50, two-person, 3-day emergency kit. Click image below to view. 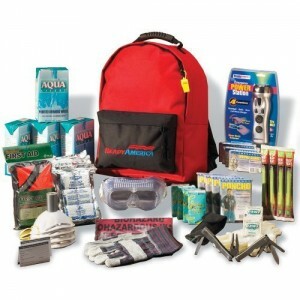 For a more advanced kit, Ready America offers a deluxe, 4-person, grab-n-go pack for $120. Click below to view.